Thirty years after launching his recording career, plus a few more engaged in performing, Billy Bragg has lost none of the firebrand passion that has decorated his music, song craft and mission to spread the word of justice. The wrath was even extended to music journalists who the exiled Barking Bard, had taken exception with for being accused of turning country with his latest album TOOTH AND NAIL. Billy duly responded by demonstrating the twang he has always possessed, albeit an Essex variety, in a rendition of his 1992 single ‘You Woke up My Neighbourhood’. This set the tone for an evening where nostalgia sat comfortably alongside the very Americana-feel to the new material. 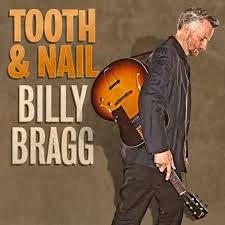 Despite the sly dig at some music critics, TOOTH AND NAIL is a far-from-subtle and excellent Americana album which has raised Billy’s profile significantly amongst those with a country leaning. As well as extensive touring stateside, which has earned respect from the alt-quarters of Music City, Billy has enlisted the services of a fine up and coming UK multi guitarist in Chris (CJ) Hillman who demonstrated his expertise on pedal steel, Dobro, conventional and B-Bender guitars to bring to life the magical sounds of the current album. Circulating the lavish surroundings of Birmingham’s Symphony Hall were the delightful tracks – ‘No One Knows Nothing Anymore’, Goodbye, Goodbye’, ‘Chasing Rainbows’ and ‘Handyman Blues’ from this album. Also featured from the release were the ramped up ‘The Reckoning’ which in true Billy Bragg-tradition warned against the far right infiltrating the working classes and the Woody Guthrie penned ‘I Ain’t Got No Home’. The latter portrays the highly respected humility Billy has for the legendary and iconic American troubadour whose relevance in modern times shows no sign of abating. The link between Guthrie and the wider Americana sound peaked with a superb version of ‘California Stars’, as this song put together in association with Wilco proved an adept vehicle for Hillman’s B-Bender to sparkle. However this two and a quarter hour set was not just confined to his transatlantic inspirations as Billy treated the loyal and partisan crowd to the songs which have defined his career, all interwoven with the political rhetoric that is as engaging as it is virtually a trademark of his live gigs. So amongst a combination of macro and micro politics, the audience sang along to old favourites such as ‘New England’, ‘The Milkman of Human Kindness’, ‘Sexuality’ and ‘Levi Stubbs Tears’. Probably the most poignant song from his back catalogue to grace the set was a solo version of ‘Between the Wars’ as the four piece backing band, which had integrated so well with the selected songs, gave way for Billy to provide a slice of acoustic ambience. The anecdotes, stories, pleas and rallying calls were ultimately too frequent to feature explicitly in a concise review but, as well as taking on board the ultimate enemy of cynicism, the tale of an encounter with Ramblin’ Jack Elliot in California was ranked high on impact. It ultimately led into a version of Guthrie’s ‘All You Fascists Bound to Lose’ and best exemplified the link between Billy’s twin passion for music and protest. By the time the audience filed out of the hall with their ears still ringing from a finale including ‘Power to the Union’ and the closing ‘Great Leap Forward’, there was perhaps one moment of Bragg brilliance from earlier in the evening to reflect on. His description of Americana as ‘country music for people who like The Smiths’ wonderfully captured the essence of a misunderstood genre. 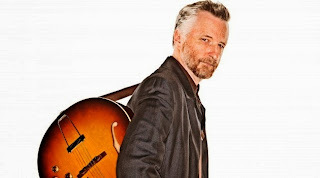 The spirit of such a movement has always resided within the soul of Billy Bragg and, with or without the twang; the onward march of his poetry, music and passion is still in full stride.